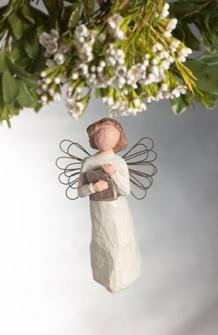 Willow Tree Angel of Learning Ornament. Resin and metal. 4.5" high. Gift boxed. Angel is holding a book. Sentiment: For those who delight in the joy of learning. Cord hanger. Gift boxed. Since 2000, Susan Lordi has been creating these figurative sculptures that speak in quiet ways of deep emotion and inspiration. Artist Susan Lordi carves each original sculpture, then pieces are cast from her original carving in resin and individually painted by hand. Expression is conveyed by gestures only - a tilt of the head, a turn of the body, or placement of the hands. The simplicity of form and the absence of facial features signify Willow Tree. Emotions are left to the viewer to interpret, which makes them powerful and personal. It is Susan Lordi's hope that these pieces be meaningful to both the giver and the receiver.